Yogurt can be part of a healthy diet, but, like any other food, should be eaten in moderation. A balanced, varied diet is necessary for good health. Which type of yogurt you choose is important in determining how much you eat, because some are more nutritious than others; the calories, protein, fat and sugar varies. It's safe and healthy to eat up to 3 cups of unsweetened nonfat or low-fat yogurt every day. A good starting point for figuring out how much yogurt you should eat per day is the recommended daily amount. For anyone over the age of 9, the USDA's ChooseMyPlate.gov recommends 3 cups of dairy per day. Each cup of yogurt counts as 1 cup of dairy. Yogurt has a number of health benefits, making it a good food to include in a healthy diet. People who consume more dairy products, including yogurt, may have a lower risk of metabolic syndrome, obesity and heart disease. Read more: What Are the Benefits of Yogurt for Men? The probiotics contained in many yogurts may have beneficial effects on health as well, according to a review published in the American Journal of Clinical Nutrition in 2014. Probiotics are beneficial bacteria found in the digestive tract that help control levels of harmful bacteria and limit the risk for certain health conditions. Read more: What Are the Benefits of Yogurt for Women? It's important not to eat so much yogurt that you go over your recommended daily calories. While some studies show beneficial effects for yogurt on weight, others show a potential for increased weight gain in some people with increasing consumption of yogurt, according to another article published in the <ahref="https: watermark.silverchair.com="" 1229s.pdf?token="AQECAHi208BE49Ooan9kkhW_Ercy7Dm3ZL_9Cf3qfKAc485ysgAAAkQwggJABgkqhkiG9w0BBwagggIxMIICLQIBADCCAiYGCSqGSIb3DQEHATAeBglghkgBZQMEAS4wEQQMcB3Svata6sCoZbNWAgEQgIIB90NQTGHUbRWlTh_txmJB42Ou6dfDufmdSXo_2h6B9CqJgHjTxog14pw0jRwRpKiMF9VBpNdqUeOvSp-Yc-fBC4hnk6k7DXmPYxbUYkcIt1HGSp500AvGQpxSQDU6Kx_oBptow7Xl7IODUoaHFDt_aiW-zkpV0mG4ucZSBn7ob6ynLVGO6URv1NqvWG81jdz4kNtRqJUPqL0w3a-8dX6x8WcYgGKRJQxIlVwJLnm9Hlei6TdLQhK7nc092ztZToWSRZhFZgdAFEDIFymp4KjuDoLjenF6Sm-i7G9sXlL4VXR6pjtIY7hvaHlb35V_pZc1bhbEljEUuTHijuQ3knU3ct6PdIvLYkaj1RoSJX0o18tQ19W2LM2wZf333prKp1FzQSuzIY33rrGnVQ7Bet9xc_AJ2bqixDtqwEZVai6zB36yBRcglvfjCDZVNviDg8TaxrfPu62JLir5r2ohn2V9Q3unz7NgBk6gd2-AS82ZnJfKRxKxJkgz2RXnTM5Ut4AQdfJdHNu9ULTo03IIpJZ4BCm9Rj3JGuehkdU1e6SvQ9StAXvXRVJ64CvcZSVTqo5JDKnxYguxba8UdKSOGWFymfqdne0SVEZSU_Dlc9iTd8YDN5i9oAIFwRkN8I7CgvZGVkXO_qFp4gLMOcngxsWQlsRT6Z0-hew6""> </ahref="https:>American Journal of Clinical Nutrition <ahref="https: watermark.silverchair.com="" 1229s.pdf?token="AQECAHi208BE49Ooan9kkhW_Ercy7Dm3ZL_9Cf3qfKAc485ysgAAAkQwggJABgkqhkiG9w0BBwagggIxMIICLQIBADCCAiYGCSqGSIb3DQEHATAeBglghkgBZQMEAS4wEQQMcB3Svata6sCoZbNWAgEQgIIB90NQTGHUbRWlTh_txmJB42Ou6dfDufmdSXo_2h6B9CqJgHjTxog14pw0jRwRpKiMF9VBpNdqUeOvSp-Yc-fBC4hnk6k7DXmPYxbUYkcIt1HGSp500AvGQpxSQDU6Kx_oBptow7Xl7IODUoaHFDt_aiW-zkpV0mG4ucZSBn7ob6ynLVGO6URv1NqvWG81jdz4kNtRqJUPqL0w3a-8dX6x8WcYgGKRJQxIlVwJLnm9Hlei6TdLQhK7nc092ztZToWSRZhFZgdAFEDIFymp4KjuDoLjenF6Sm-i7G9sXlL4VXR6pjtIY7hvaHlb35V_pZc1bhbEljEUuTHijuQ3knU3ct6PdIvLYkaj1RoSJX0o18tQ19W2LM2wZf333prKp1FzQSuzIY33rrGnVQ7Bet9xc_AJ2bqixDtqwEZVai6zB36yBRcglvfjCDZVNviDg8TaxrfPu62JLir5r2ohn2V9Q3unz7NgBk6gd2-AS82ZnJfKRxKxJkgz2RXnTM5Ut4AQdfJdHNu9ULTo03IIpJZ4BCm9Rj3JGuehkdU1e6SvQ9StAXvXRVJ64CvcZSVTqo5JDKnxYguxba8UdKSOGWFymfqdne0SVEZSU_Dlc9iTd8YDN5i9oAIFwRkN8I7CgvZGVkXO_qFp4gLMOcngxsWQlsRT6Z0-hew6""> </ahref="https:>in 2014. The calories in yogurt can vary quite a bit, with a 3/4-cup serving of vanilla nonfat yogurt supplying as many as 143 calories and a 3/4-cup serving of nonfat vanilla yogurt sweetened with a low-calorie sweetener instead of sugar containing as few as 73 calories. USDA's ChooseMyPlate.gov recommends choosing nonfat or low-fat versions of yogurt; full-fat versions can provide a significant amount of fat, a large portion of which comes from unhealthy saturated fat. A 3/4-cup serving of plain whole milk yogurt has more than 5 grams of fat, which is about 8 percent of the daily value for fat of 65 grams. Eating 3 cups of this yogurt would use up more than 30 percent of your recommended fat grams for the day. Low-fat yogurt has about 2 grams of fat per 3/4-cup serving, and nonfat yogurt has less than 0.5 grams of fat per serving, making both a better choice if you plan to have multiple servings of yogurt per day. Opt for plain yogurt over the flavored varieties, as these may be quite high in sugar. Choosing Greek yogurt can lower the sugar content even further, as the whey that's strained out in the process of making Greek yogurt contains much of the natural sugar in the yogurt. The American Heart Association recommends that women get no more than 100 calories per day from added sugars, which equals about 25 grams of sugar per day, and men get no more than 150 calories, or about 38 grams per day. A 3/4-cup serving of low-fat fruit yogurt can have more than 32 grams of sugar, while the same amount of plain low-fat yogurt has about 12 grams of sugar and nonfat Greek yogurt has less than 6 grams. 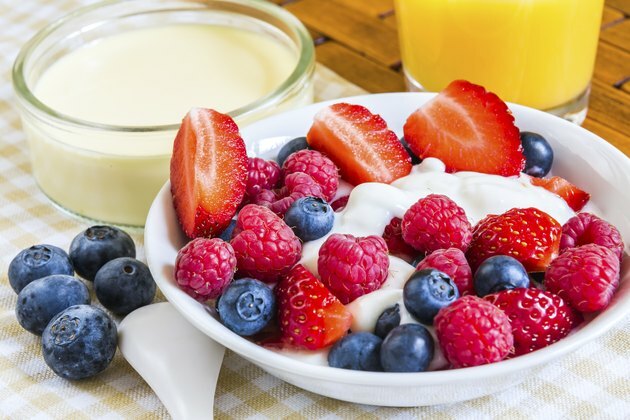 Plain low-fat yogurt isn't necessarily appealing to everyone, but you can take this nutritious yogurt and add other foods to it to improve the flavor and the nutrient content. Consider adding fruit to give your yogurt more sweetness and mixed nuts to add some crunch, while increasing the protein and healthy unsaturated fats. Both fruit and nuts contain essential vitamins, minerals and fiber. Another way to make yogurt more filling is to mix in some high-fiber, low-sugar cereal.